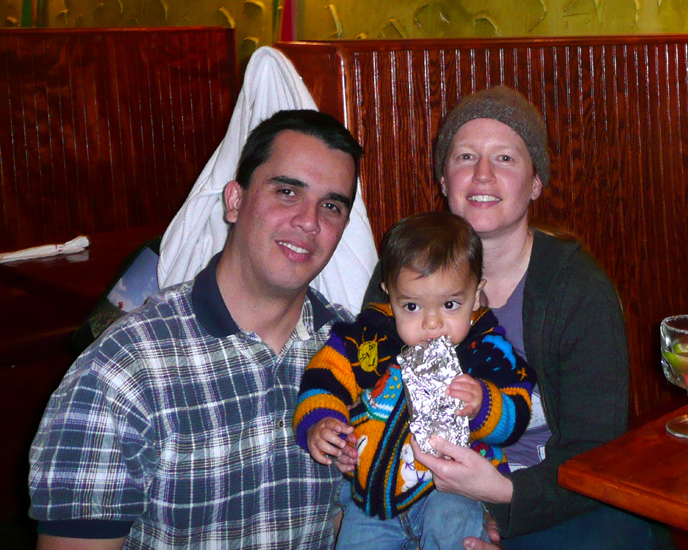 We celebrated Logan’s 1st Birthday at the Mexican Restaurant Sí Señor. 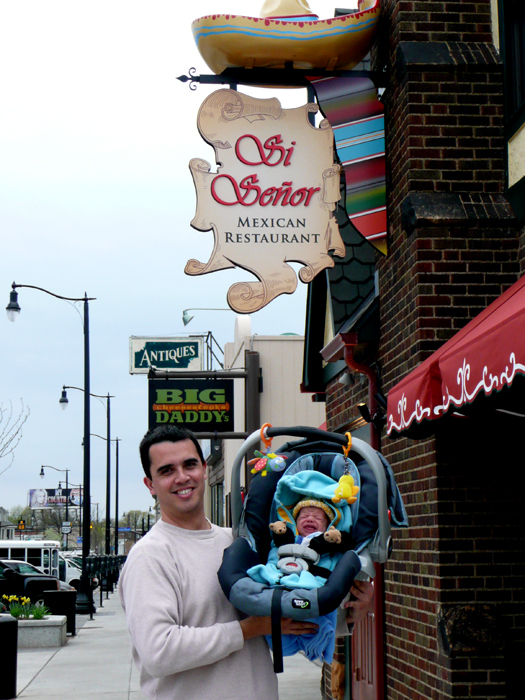 This seemed appropriate since it was the first restaurant that Logan ever visited, when he was three weeks old. Since I’m just starting this blog, I plan to use photos from his first year and do some flashbacks, trying to remember important events and milestones through photos. When we first had Logan, I remember asking parents when their babies hit certain milestones and was surprised when they couldn’t recall. Sure, they wrote down the important ones in the baby book, but babies grow and learn at such a rapid pace, you can’t remember much off the top of your head. Now here I am, having a hard time remembering exactly when Logan mastered turning on and off the light switch, when he understood he couldn’t go down the stairs head first (we only have 2 steps, and they’re carpeted), or when he figured out he could open the toilet lid and stick his hand in. These are all new skills that he acquired in the last couple months, yet I couldn’t tell you exactly when. 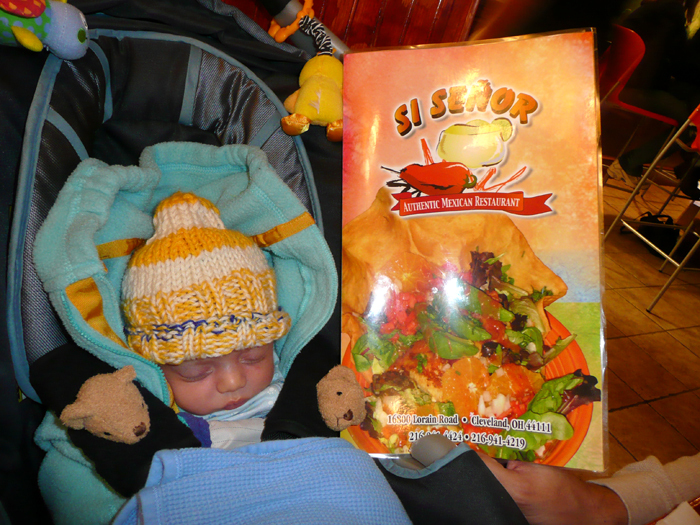 Logan liked to cry when he wasn’t awake, but the restaurant was loud, so he was relaxed and went to sleep. He was happy, and so were we! One of our first family photos! Once we left the restaurant the screaming resumed. Glad those days are over! Family Photo on 1st Birthday! Logan eating tin foil. One thing I’ve learned about being a parent of a one year old, is that you never get to eat in peace. Even if he’s just eaten, he wants whatever you have. And he will beg and be persistent until he gets it. And yes, I’m feeding him with my knife, because I forgot his little spoon at home. 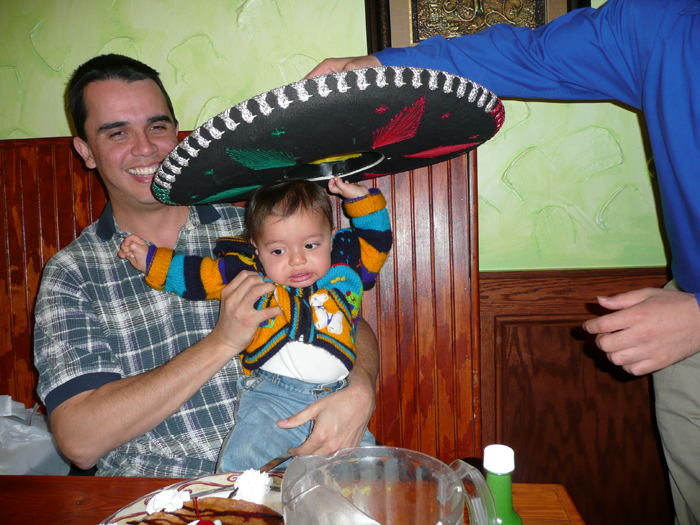 Logan was not excited about the birthday sombrero. 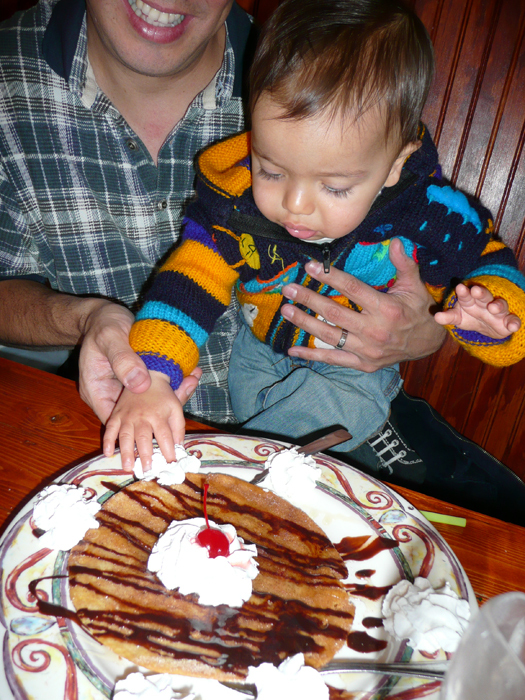 He was excited about his birthday dessert. He got to eat a little of the whipped cream, but I promptly devoured the rest of it once we got home. 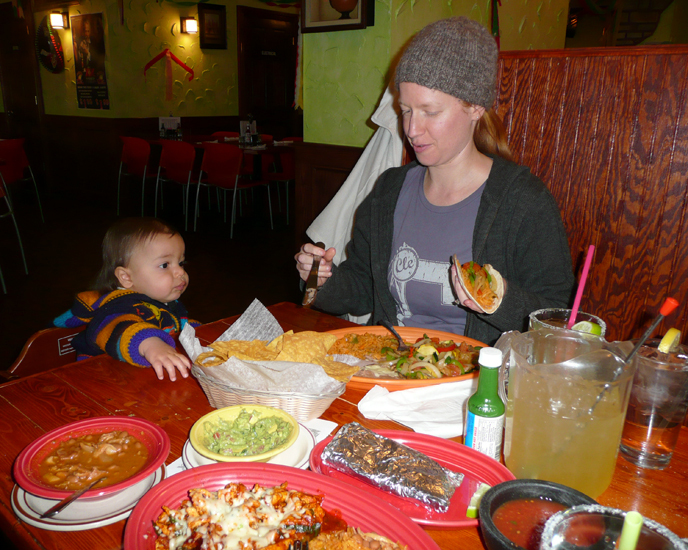 This entry was posted in Food and tagged birthday, eating, food, Logan, mexican. Bookmark the permalink. 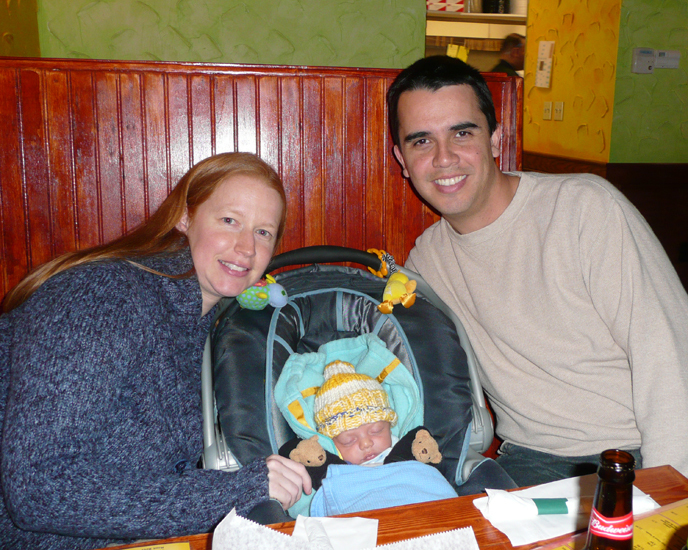 Love this post – brought smiles for an adorable baby, a new family, & traditions, as well as wonderful memories of my own experience with first baby, second baby, and birthdays celebrated along the way. I didn’t record so many milestones, either, and how I wish I had! Let’s be practical, Redhead, there just isn’t much time when you’re busy being a mom! thanks for your support Marcia!